American Isis: The Life and Art of Sylvia Plath by Carl Rollyson is a much anticipated biography (St. Martin's Press, 2013). Donald Spoto calls this new Plath biography "compulsively readable." Lois Banner says Rollyson shows how Plath "both shaped and reflected her times, becoming a symbol for our age." Carl has recently made a book trailer for his American Isis: The Life and Art of Sylvia Plath. (Mind you, this is not a trailer for a movie...just an advertisement for the book.) 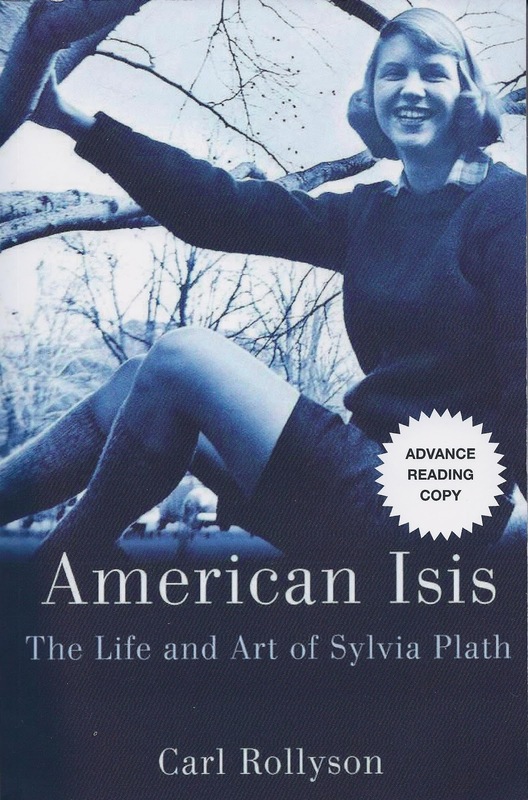 American Isis is the first full length biography of Sylvia Plath since 1991, and benefits from: a wide range of recently opened archival collections in the US and England; the 2000 publication of Plath's Unabridged Journals; interviews with friends and students from Smith College; and features new information from A. Alvarez, David Wevill and Elizabeth Sigmund. In conjunction with the release of this book trailer - a novel idea, by the way, to promote both the the book itself, the subject, and the act of reading - Rollyson will start Tweeting sentences from his book on Twitter (@crollyson). Follow Carl on Twitter to get a sneak preview of American Isis: The Life and Art of Sylvia Plath. Buy the book American Isis from Amazon.com; or the US Kindle edition. Or, buy the book American Isis from Amazon.co.uk. Are you intrigued about the cover photo for American Isis? I sure am. The photograph was taken by Plath's fellow Lawrence housemate Judy Denison, whom Rollyson interviewed for his book. Plath was a resident of Lawrence in 1952-1953, Spring 1954, and then 1954-1955; Denison matriculated in the fall of 1953 and graduated in 1957. Denison took the photograph in April 1954: just barely over two months after her return to Smith from her breakdown! In an undated letter to her then boyfriend Gordon Lameyer, which can be accurately dated based on the evidence in the letter to November 6, 1954, Plath begins her letter with a description of the probably the same apparel worn in the photo. The letter cannot be quoted as it is unpublished, but suffice to say she describes herself as wearing that day an old Navy sweater, Oxford gray Bermuda shorts, and knee socks. Sounds like the photograph on Carl's book, no? PH! Thanks for the link back, I really appreciate it and am sure Carl does too. I have posted Rollyson's trailer on my Facebook. I love how it takes us through Plath's life in pictures--many of the pictures not widely seen--and how it does not interject any commentary. Well-done, Carl! I too am looking forward to the book, which I pre-ordered some time ago. I'm the one who took the cover photo. I had admired Sylvia's poems in Seventeen and was awestruck at living across the hall from her. She was kind to me, a naive young freshman. I took this photo of Sylvia in the tree in front of Lawrence House in April 1954 (with a plain old box camera). As I recall, she was wearing charcoal gray Bermudas and a green wool Shetland sweater, the proper uniform for a Smith girl. My negatives were all filed and available. I am donating the fee for the photo to Smith College. I live in Golden, CO, and Carl R will be doing a book tour here at the end of March. Carl seems to be the first person who ever contacted Smith alumnae for interviews, and that is why he now has this never-seen photo of Sylvia. Thank you so much for sharing the image and story, Judy. Interesting that Smith alumnae have been sparsely sought.